God I love the four seasons! It is just beautiful and stunning. Yeah! What she said. Really fun to see the complete set in one post. That is awesome! Thanks for combining them. Hey, architectural interest in a mall! It's a lost art. 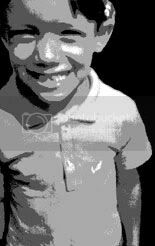 What's it look like now? 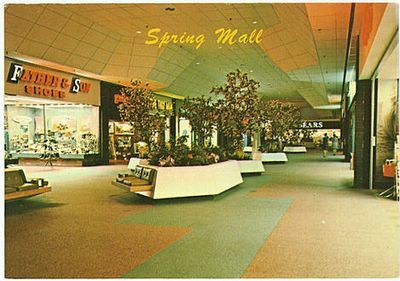 Serramonte Mall in Daly City CA has a similar layout. Each wing also is based on a season. Mostly paint colors, but it gives you an orientation... and some interest. Serramonte was remodeled using Feng Shui principles. I don't know if it works, but I find the mall more comfortable now. WOW...all I gotta say is...WOW! A themed shopping mall! They don't make 'em like they used to. This reminds me of the Old Town Mall in Torrence, CA. I think I got a couple of postcards of that place. I might have to e-mail 'em to Keith. I was just at Park City last weekend. It was the first time I was there in ages - and I mean ages. I don't remember how it looked last time I was there it was that long ago. I just remember it being huge and uniquely configured. It is still as huge as I remembered - some times when we're younger, things seem bigger than they really are. The outside of the mall still holds on to a lot of the old-school features. The Sears has some very dated entryways with arched cement "overhangs" over the doors. The other anchor stores all look like you would expect "older" stores to look. No glossy facades, strange angles, odd colors/lighting, etc. All of the non-store mall entrances are being rehabbed - all signage has been removed so I'm not sure how they looked recently, in terms of modern or not. 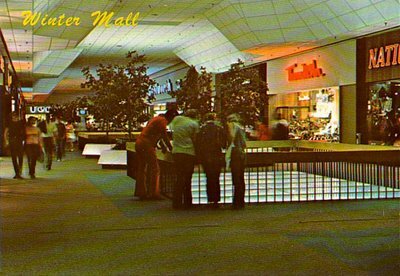 The inside of the mall is clean and bright. It's largely fully occupied. One kind-of unique feature about it's layout is that many stores will have entrances on both sides of a "spoke". The wings no longer have season themed names, but are now named after the anchors: Boscov's Mall, Bon Ton Mall, JC Penney's Mall, and Sears Mall. The "hallways" that have no anchor at the end are also named: North Mall, South Mall, East Mall, and West Mall. The "spokes" of the design alternate between Anchor names and Directional names. All meet in the center of the mall. There is no longer a fountain there, which is kind of a bummer. Instead, they've removed the roof and added a "big top" type spire with clear "plastic" for lack of a better word that comes from the tip of the spire down to the roof of the mall. It brings in a lot of light, but it looks out of place. There's an information booth and a lot of kiosks in the center of the mall. There's no entrance that takes you in to the center - the layout makes that impossible. 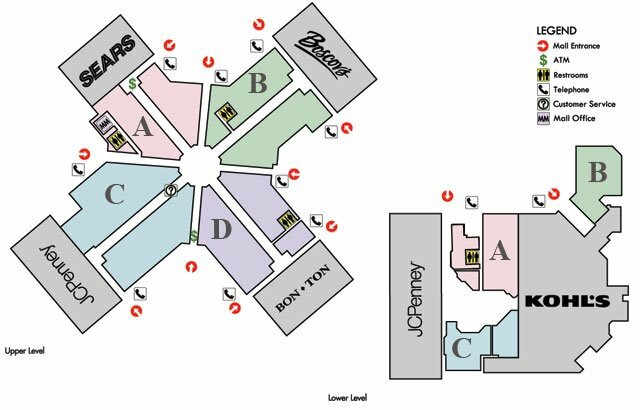 There's a Kohl's in the basement, as well as a food court. 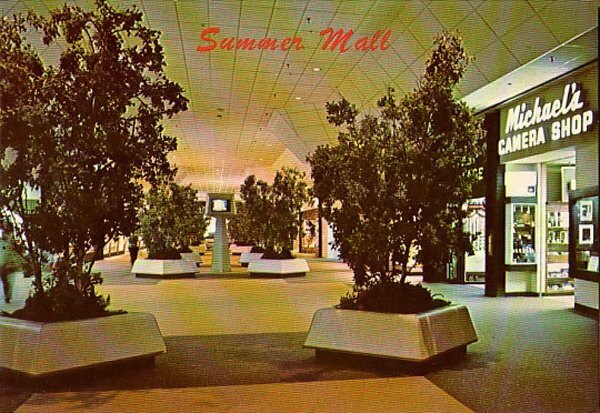 The holes in the floor, seen in the Winter Mall photo are still there, but they've got a plywood barrier around them, which tells me they're planning something. The mall decor is modern, but still somewhat "comfortable" (ie: not entirely sterile). They have lots of very nice seating areas with large padded benches and small padded rocking chairs. Their restrooms are among the nicest public restrooms I have ever seen anywhere. Two notable (and possibly original) features that I thought were interesting: The Bon Ton Store (I believe formerly local store Watt & Shand) has a really nice natural stone facade, which appears to be original, as hints of a former logo can be seen. They have a stand-alone escalator at their entrance that will take you to the 2nd floor of the store, allowing you to bypass the first floor entirely. It's only goes up, however. If you want down, you have to use the escalator in the store. The Boscov's store (which, if memory serves me correctly, was a Pomeroy's the last time I was there) has a staircase off to the left of their facade which leads up to it's Greenery Restaurant, which is on the 2nd floor, and has tables that overlook the entrance and that wing of the mall. I did note that around the top of the stores on the wall in each anchor wing was a design that had leaves on it. I didn't note if they were seasonal (ie: orange for fall, green for spring, etc). I'll try to look better next time. Perhaps there may still be a hint of the old there. Park City is definately worth a visit if you're in the area. There are a number of stores on the perimeter, and the chance to see local salvage store chain Ollie's Bargain Outlet operating out of an old Children's Palace store without making any effort to change the facade was rather amusing and almost worth it alone. Like the jingle on their old tv commercials used to say, "Make A Day Of It At Park City". An excellent recap Railyn! I haven't been there in years, but your description takes me right back. I must have missed the Pomeroy's years...I remember it as Gimbels! Replacing the seasons with names of the stores. Ooh, how uberly creative! And I do remember Gimbel's department store!! I guess they went under or were bought out also in the 80s. They were at Harrisburg East Mall as well. I work at Park City Center now and it is a beautiful place. It has become so brigt with light and they have really updated the place. As much as I love the four seasons I think it has grown to be a much more vibrant place to shop. This is perfect because last time I was in this Mall I got all things I wanted to buy, and also I had a good sight because I could see beautiful women there wearing their most beautiful dresses it seemed a catwalk. 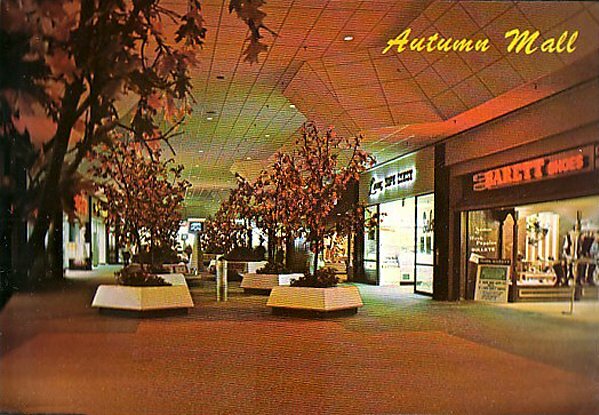 It's worth noting that in the "Winter" postcard, those people are looking down through a glass skylight onto a skating rink downstairs, which was across from a video game arcade and a farmer's market, which, in addition to tables selling Amish produce, shoo-fly pies and crafts, featured used book sellers and (for a while) a comic book store. 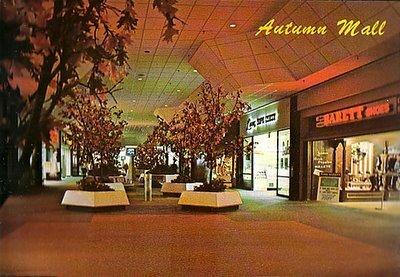 I think the "season" themes died in the 70s because I have always remembered the corridors being named for their anchors, back then Penneys Mall, Sears Mall, Watt and Shand Mall, Gimbels Mall and of course the ones named for the cardinal directions. The carpeted floors and the fountain disappeared around 1983 if memory serves. Originally the basement level consisted of WLYH Channel 15, an arcade and, if memory serves, a farmer's market? Most of that was changed around 1985 or 86 when a food court and a discount store, Clover, was added to the lower floor. I was last in Park City in 2005 and it looked very differenrt than I remember from childhood. 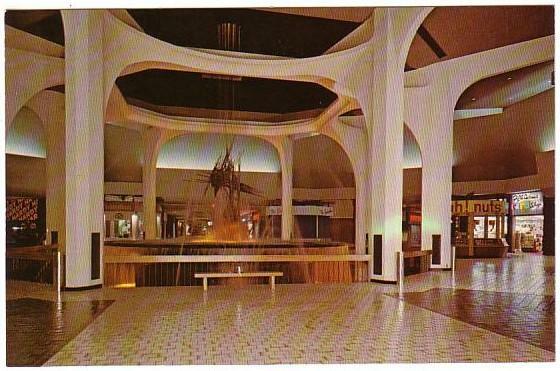 Much more modern, but much of the 1970s charn is gone. If I remember right, didn't Darth Vader make an appearance here back in the day to promote the first Star Wars movie? I was 6 years old and I remember the center court being packed, and we couldn't get very close to him. I don't remember any other details other than being there.